Setting up workflows dependent on these defining characteristics will allow you to do some basic personalization, sending messages that will be most relevant to prospective students at the most appropriate time in their journey. If you missed the 3-part series we did on audience segmentation, start here: Audience Segmentation Blog Post 1. Depending on your unique institution’s approach to email marketing, each workflow may be 5 to 12 emails or more, with each workflow scheduled to send at regular intervals to a group with a defined set of characteristics. This may be determined by an established lead scoring technique, or simply by stages in the application process. Lead scoring is important, but smaller shops may not have the bandwidth to set this up. Frankly, many of the larger shops don't do this well either. Pro Tip: every act of engagement is not worth points. The point of lead scoring is helping you focus the valuable and limited time of your recruitment team. Those prospects demonstrating engagement at different points in the funnel should receive different types of information and different levels of attention by your team. If you want to learn more about this, come see Ben and Hillary Dostal, Northeastern University Director of Global Initiatives present on the topic at Nafsa in May. As a basic example, you may have a simple workflow (a set of at least 5-6 emails) for prospective MBA students from India who saw your ad on Facebook and provided their contact information. This high level, initial contact workflow may provide basic information such as an overview and introduction to the program and the school or a student testimonial. Then, when a student has completed a defined action (for example: clicking through three or more emails, or reaching out to admissions), they may transition into another workflow. This may be another 5-6+ emails that provide deeper information like faculty bios, specific curriculum information, how past work experience is evaluated and other application instructions. From the point of beginning an application, many institutions will shift prospective students into a basic workflow of instructions and reminders all relevant to the application process, in addition to direct contact with admissions officers. Quick tip: Consider, the most pivotal moments for prospective students in your institution’s recruitment funnel. For many institutions, these moments will be initial awareness, engagement with marketing materials either online or in print, a conversation with admissions, application and enrollment. Define these points for your institution. This is important: Consider each point of engagement as an opportunity to bring the prospect to the next micro-conversion in their decision making. Do not push every interaction to "apply now." That's the desperate rookie mistake. Build the relationship before you ask them for something significant. Is the subject line engaging to your readers? You only get one chance to make a first impression. With your email marketing, the subject line is it. One chance to grab their attention – to intrigue them, to make them curious, to make them want to read more. This youthful crowd is tough audience. Creativity and humor can go a long way to get their attention in a sea of boring and contrived. Get approval to be a bit bold and test, test, test. If you are not tracking the success of your email content and subject lines, well, you get the results you invest in. A subject line should draw the reader in, make them feel important, welcome and engaged with the content. At the beginning of the relationship, it should make them smile. Later it can become more matter of fact, addressing their specific interests. But then you'll still want to sprinkle in the smiles. Quick tip: don’t give away the whole story in the subject line and intro text. For example, instead of introducing an event with its full title – consider something intriguing that leaves them wanting more. Consider subject lines in native language, even if the rest of the content is in English. How dense is the body copy? We know you have so much good information to share – from program descriptions, to faculty bios, to events, to campus life, and much more. But, the number one mistake we see higher ed institutions make is trying to condense all potentially relevant information into a single email, especially at the top of the funnel. This often results in content-heavy emails that are visually unappealing and honestly, overwhelming. They simply won't be read. Your open and click rates will document this finding. Remember, when you are writing for an international audience, presenting your content in an inaccessible format won’t work. Many of your prospective students may be reading in English as a second language (and remember, they may share your emails with family or friends) and likely won’t have the patience to dig through all of the content you want to share. Attention spans are short, around the world. Quick tips: Keep it simple. Remember, 3-4 lines per paragraph is more than enough. Split your content into easily digestible snippets and it stands a higher chance of being absorbed. Use emojis and other images to spruce it up. Next week, we will discuss creating effective CTAs, timing and scheduling and testing your campaigns for success. 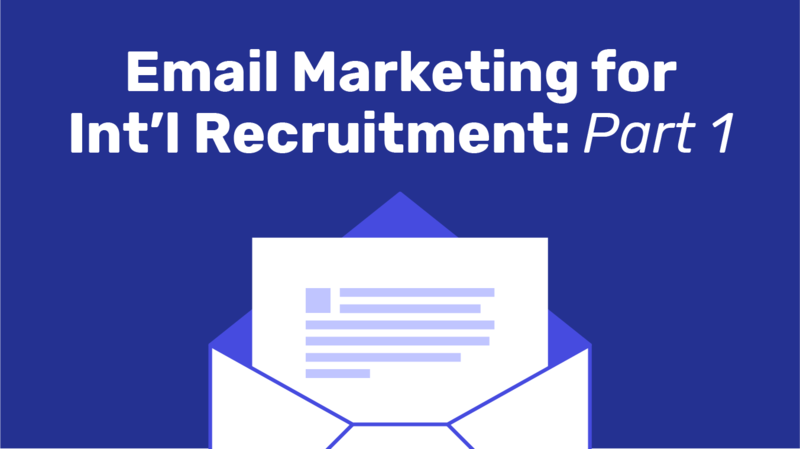 Do you have tips and tricks for email marketing that work for your institution? Let us know in the comments.